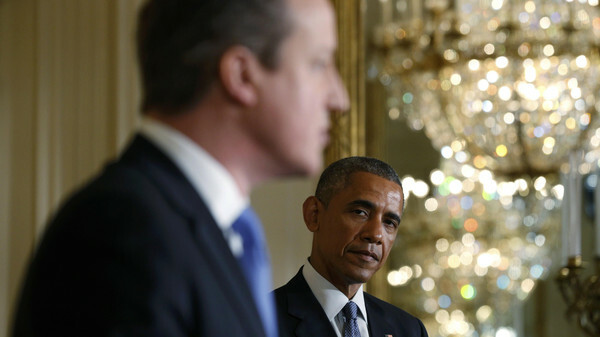 U.S. President Barack Obama (R) listens to British Prime Minister David Cameron during a joint news conference following their meeting at the White House in Washington January 16, 2015. British Foreign Secretary Philip Hammond and U.S. Secretary of State John Kerry will host a meeting in London on Thursday of members of the coalition against the Islamic State of Iraq and Syria (ISIS) group, officials said. The one-day talks will involve foreign ministers from about 20 countries, including Arab states, to discuss progress so far on tackling the Islamist militants who occupy swathes of territory in Iraq and Syria. A British official confirmed the meeting will take place at Lancaster House in central London, a fortnight after deadly attacks in Paris by three gunmen claiming to act on behalf of Al-Qaeda and the ISIS group. “This will be an important opportunity to take stock and assess the progress made so far in our joint efforts to tackle ISIS’ poisonous ideology,” Hammond told the Daily Telegraph newspaper, using an alternative name for ISIS. “The key active partners in the coalition, including our Arab partners, will gather in London to decide what more we need to do to degrade and defeat ISIS. The meeting comes after U.S. President Barack Obama and Prime Minister David Cameron met in Washington this week. Discussions will focus on five areas — foreign fighters, the military campaign against ISIS targets, its sources of finances, strategic communications and humanitarian assistance, the official said.